Welcome to Angel of Siberia! Each kitten will have his/her own registration certificate. We are located near Seattle, Washington. We specialize in hypoallergenic kittens for people who suffer from allergies. We purchased our cats from Russia, and other European countries. Our goal was to handpick the best quality cats. Siberian Traditional Forest and Neva Masquerade cats are hypoallergenic. This means their saliva, which causes allergies, has less Fel D1 protein,than saliva in other breeds. They have full, thick, rich triple layered coats. These cats are smart, loving, and gentle. They are raised around our children. We do not cage our cats and kittens. They live inside our house, and we love them very much. All of our cats are registered with TICA and WCF. We breed hypoallergenic Traditional Forest Siberians and color pointed Siberians also called Neva Masquerade. The Neva Masquerade name is derived from the similarity of the mask on his face to a mask of a beauty worn at a masquerade. 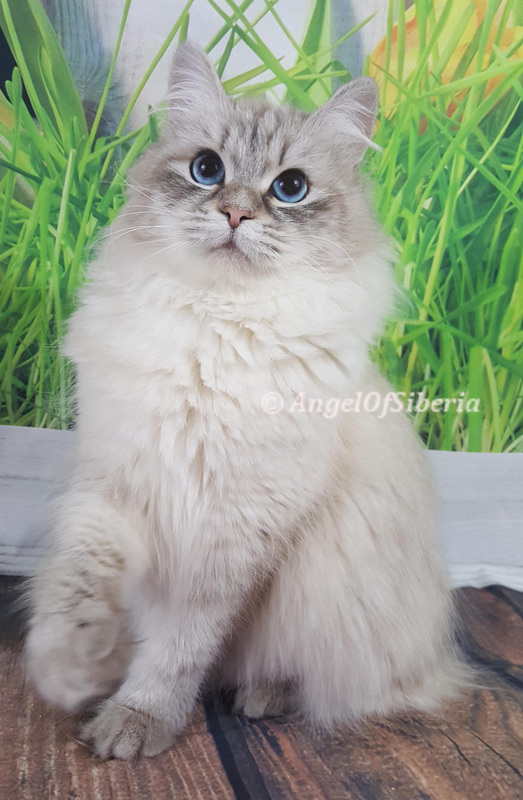 View Available Siberian kittens for Sale in Washington! We love getting updates and pictures about your furry buddies after the Cattery. Our cats are registered with TICA and WCF, also we passed PawPeds Academy course G1! Neva Masquerade cats have eye colors that range from light blue to sapphire blue. Cats of this breed are very gentle, are good looking and have a very pretty little face. If the Neva Masquerade cat gets into some mischief, glance just once into her beautiful eyes and you will forgive her of everything! Have this cat once and you will forever stop thinking about the other breeds. Visit our Neva Maserquerade page for more info! Traditional Forest Siberian cats have eye colors that ranges from green to yellow to brown. Cats are a little bit smaller than Neva. They vary from medium to large size, strong and powerfully built, paws are rounded, bushy tail.They have barrelled chests and medium/large sized ears, large eyes, broad foreheads, and stockier builds than other cats. Their large round eyes give an overall sweet expression to their face. Siberians have a slight arch to their back, due to the fact that their hind legs are a bit longer than the front legs. This shape contributes to their incredible agility and athleticism. Hypoallergenic qualities of the Siberian coat have been noted and commented on for almost ten years. Visit our Traditional Forest Siberians for more info!